HIGH CHAPARRAL (IRE) (Bay 1999-Stud 2004). 10 wins-2 at 2, The Derby, Gr.1. Champion Aust. Sire (AEI) twice. Sire of 1707 rnrs, 1067 wnrs, 121 SW, inc. So You Think (MVRC WS Cox P., Gr.1), Dundeel, Shoot Out, Ace High, Descarado, Monaco Consul, Rekindling, Contributer, Toronado, Wigmore Hall, Lucky Lion, Free Eagle, Tivaci, Redwood, Youngstar, Charmont, Fenway, High Jinx, Hiyaam, Montoya's Secret, Pondarosa Miss, Wrote, Joanna, Enaad, etc. Arterial (g. by High Chaparral). 2 wins. See below. Bombard (g. by Fusaichi Pegasus). 4 wins from 1200m to 2050m in Aust. Hifranc (g. by High Chaparral). 2 wins at 1400m, 2100m to 2018-19 in Aust. Assertive Star. 4 wins from 1400m to 2400m, A$86,895, to 2017-18, 3d MRC Ladbrokes.com.au H.
Axford. 2 wins at 1050m, 1300m in Aust. Carano. Winner at 1600m in 2018-19 in Aust. STAGE PRESENCE - DYNAMIC BLITZ (H.K.) (Elusive Quality). 10 wins to 1200m, A$39,870, HK$4,354,500, M$288,000, 441,600Dhs in Aust., HK and U.A.E, Meydan Al Shindagha S., Gr.3, HKJC Hong Kong Racing Journalists H., Barker H., Association of Hong Kong Journalists H., MRC Ark Regal H., HKJC HKU JC Clinical Research H., Chevalier Pipe Technologies H., Jebsen Marine H., 3d Macau Sand Premier Cup, L.
NEW TIPPERARY (High Chaparral). 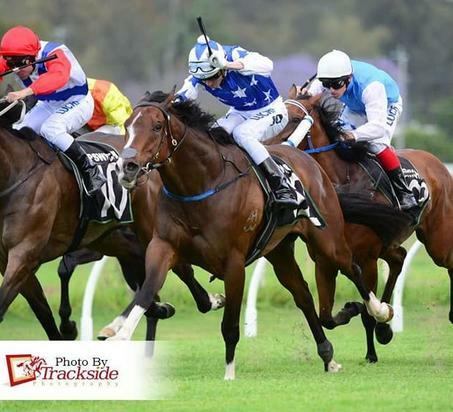 7 wins from 1350m to 1900m, A$451,225, to 2018-19, Newcastle JC Cameron H., Gr.3, ATC November Topaz H., Blacktown Workers H., McGrath Estate Agents H., Pro-Ride H., 2d ATC Ajax S., Gr.2, Turner Freeman H., 4th ATC Japan Racing Association P., Gr.3, Scone Cup, L.
Race Record: 14 Starts 2-2-3 A$38,725. 2 wins at 1350m, 1600m to 2018-19, Ipswich TC Learoyd Mini Diggers H., 3d GCTC Bernie's Produce P., Ipswich TC Carlton Mid H.